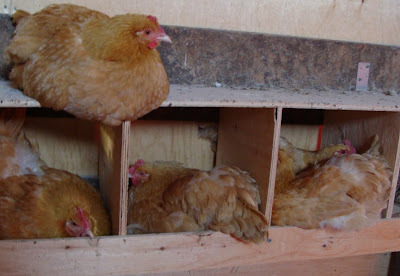 When it comes to guidelines for chicken accommodation, "one nest box per four hens" is a common recommendation. I've even seen "one nest box per eight hens". Our four nest boxes for nine hens should be more than enough, you would think. Do they produce well? Do you have a heat lamp in there or do you find it's not necessary? They must have been absolutely bursting get those eggs out. I love the expression of extreme concentration on the face of the hen in the bottom left! Perovskia - we're getting six eggs a day on average now, so yes, they're doing really well. We've been leaving a heat lamp on in there since it got cold, but I'm not sure it makes a huge amount of difference. The recent mild spell has been great, as they've been able to get outside again and fill up on grass. Oh, I bet the 'warm' weather we've been having has been doing them wonders.